Here is a great drawing tutorial for kids and preschoolers. 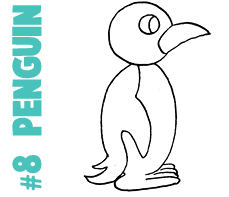 Learn how to draw a cute cartoon penguin by drawing a #8. Find out with the easy instructions below. – Draw a circle for the eye. – Draw an oval foot. – Draw a sideways letter ‘M’ shape for the tail. – Draw a letter ‘J’ shape for the start of the beak. – Draw a curved line in the eye. – Draw a sideways #2-shape for the wing. – Draw a #3-like shapes in the feet. – Draw a sideways letter ‘v’ shape for the beak. – Draw the rest of the wing. Finish the drawing of the penguin. 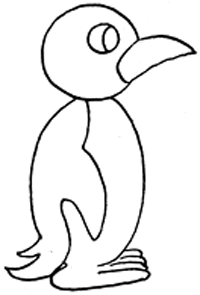 You can color him in if you like…sometimes penguins are blue and sometimes they rae blac. Thanks for sharing this! It sure helps a person who has never had any artistic ability or thought processes to draw. This article was written on 18 Aug 2015, and is filled under Birds, Drawing for Kids & Preschoolers.